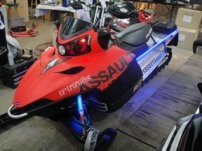 On this snowmobile, 6 of our LED accent strips were used along the tunnel and under it, 2 sets of the 8 piece round module lights were placed in the shock towers, along the bulkhead, and under the hood, and Dragon Eyes were used in the headlight ot give this a very bright light at night. With all this blue, it really glows! 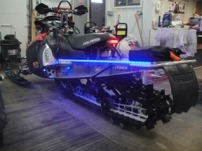 This sled even has a HID headlight in it! 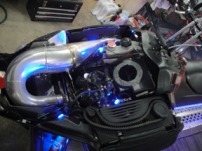 You can see the LED strip Lite on the seat also!